Click here to view the press release published by Campari America. OSLO, Norway--(BUSINESS WIRE)--Thin Film Electronics ASA (‘Thinfilm’) (OSE: THIN; OTCQX: TFECY), a global leader in NFC (near field communication) mobile marketing and smart packaging solutions, today announced Campari America as a new customer. 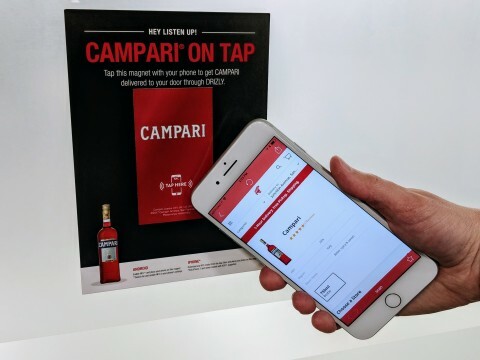 Campari America is using Thinfilm’s NFC mobile marketing solution to enable consumers to purchase its spirits brands by tapping their smartphone to a ‘connected’ refrigerator magnet. Once tapped, the magnets – which feature Thinfilm’s NFC SpeedTap™ tags and fully integrate with its CNECT™ cloud-based platform – take consumers to a product page on Drizly, the popular beer, wine, and spirits consumer-delivery platform. Consumers are then able to add the item to their cart and immediately check out, all in one cohesive mobile experience.